We stood in the graveyard; my husband, his parents, my three kids and me, looking out onto the crop of scattered, moss covered tombstones. The headstones were surrounded on one side by a black, gothic iron fence. Shivering, I pulled my sweater tighter around me. Then I bent down to adjust a section of leaning fence. Chris piled the last of the dirt onto the mound and spread the soil evenly across an area he had outlined with large fieldstones. The sight of three freshly dug graves under the darkening sky added to the haunting feeling that made the hairs on the back of my neck stand up. We all stopped talking and stood still, taking in the somberness of it all. Chris brushed the loose dirt off the front of his jeans. “Well, I want to get this finished before nightfall,” he said with a hard sigh. “You did a lot of digging,” I nodded. My eyes scanned the eerie landscape and settled on a skeleton, its skull partially exposed in the piled dirt. I gazed at the desperate arm reaching out and the bony knees, drawn. A headstone glinting in the spotlight marked a dead person’s life: Fester N Rot, RIP. It filled me with joy. “It works!” Chris shouted. In his hand, he held a remote control. I heard a spraying sound. 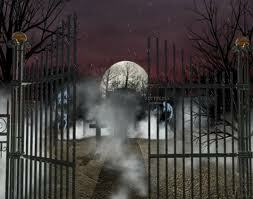 A fog rose above the tombstones and consumed us. The vapor created by our fog machine lent just the right touch. This, of course, was no historic graveyard. This year, for Halloween, we gave ourselves permission to explore our darker side. We moved beyond fake spider webs and carved pumpkins and went full strength, all-out creepy with fake headstone props and freshly dug “graves” which, next summer, will double as garden plots. With the help of my in-laws, my family created a grim and gruesome graveyard scene on our front lawn, replete with controlled weather elements. Sometimes all it takes is some haunted graves and severed skeletons to bring a family together. of course your graveyard is now going to blow away in the hurricane! It could be in your yard by tonight. Love it. Good writing. You had me holding my breath in the beginning. Makes me want to write a story! Thanks! Hope it inspires a story! at first i thought you were burying a pet hamster; you’re family outings and projects are much more fun than the ones i remember…. Veery skeery! Hope you and the fam are safe. Praying for you all! Keep in touch. “Skeery.” I love how I can hear your voice even when I can’t hear it. 🙂 Thanks for your concern, Stacey. Will keep you posted. This is so funny to me because the reality of it, in my family at least, is too true. The only time our family seems to get together is when someone dies! Haunted graves, severed skulls, and Frankenstorms to get the family together. Fear and a little burying are great for family bonding. I’m so happy for you. Ah, yes, how could I forget about Frankenstorm? Hopefully that will keep us together and not flying through the air in different directions. Very cute! Hope you and your little grave diggers have a Happy Haunted Halloween. So creative – I love it! I love Halloween too. And I hope I’ll continue to be here to see my lawn and that the hurricane doesn’t whisk me away! I am praying for all of you back east as I continue to watch the weather reports. Thanks so much, LuAnn. So far just forceful winds and light rain. Meantime, we’ve hunkered down and grandma has a homemade apple pie baking in the oven. Taking advantage of power while we still have it! Sorry–hit the ‘post comment’ button too soon. I was saying that looks great, and I bet the neighborhood kids (and adults) will love it. It’s fun to share our spooky decor with our neighbors, but it’s more fun to share with them our summer harvest! Ooooh, creepy! Good idea, and one the kids will remember to tell their kids! I’m not looking forward to my boys growing up and eventually liking the gross and scary part about Halloween. I think I’ll have to set limits on where the gruesome gore stops (i.e. not inside my house!). Yeah, I hear you. A fake severed pinky finger is my limit for indoor props. It shows up in the strangest places — my pillow, the cookie drawer, a bowl of onion dip . . .
My kids want to make our yard look super scary. 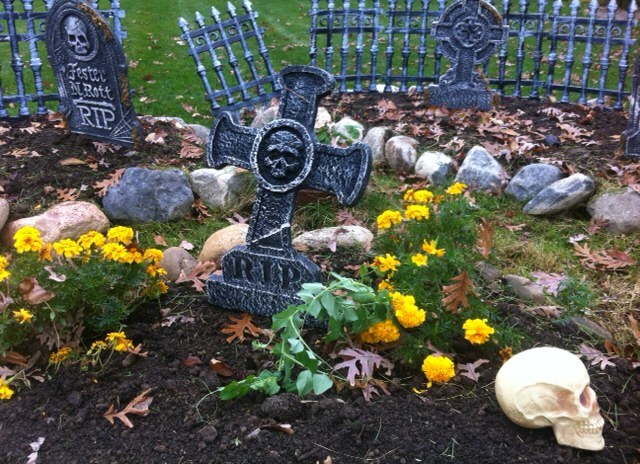 I just worry about the young trick-or-treaters but a graveyard is cool! My husband likes to wait for kids to come to the door, then sticks his hand through the mail slot and screams loudly. Thankfully he only plays that trick on older teens and not helpless young children. Great read! I was really sad at the beginning and, by the middle I was concerned that you were confessing to a crime. I’m glad you found a new family bonding experience – who needs a family dinner, right? I suppose we could bond over bones at either one! We love Halloween too. Sadly thanks to Sandy it’s been postponed this year, and that’s the least of our worries! I had to double check to make sure you hadn’t moved into the neighborhood, Lisa. Our neighbor across the street has a fog machine and many of the grim acoutrements that you described. It’s a real kid-magnet come Halloween. Great fun! Have a boo-ti-ful Oct. 31st. Sounds like they caught the creepy spirit too! How festive! One day I’ll be creative enough to pull off something like that! My kids would have loved this – maybe someday we will do this with grandkids!!! An activity that can span generations!